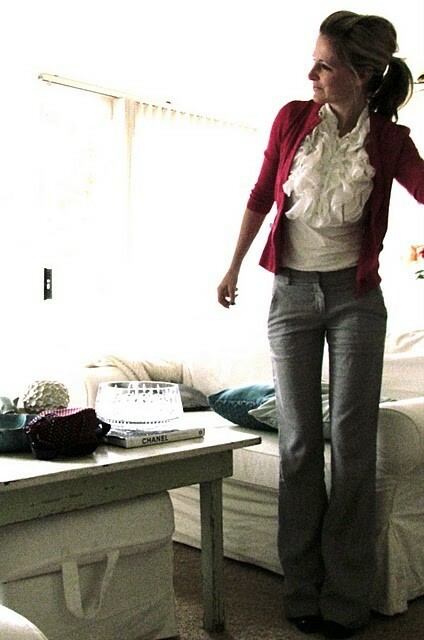 This was one of my first "style" pins on Pinterest - I love the ruffle top with the red sweater and trousers. This outfit would be perfect for work! Photo from the blog Leather and Lace. I put together a similar outfit using a ruffled top from Target, pants and sweater from Express, and shoes from Aldo. Click on any of the images below for more information. This was also my first style pin on pinterest! Thanks for the more affordable option! This was one of my first pins when I got pinterest. I love this outfit!